And here is an update that includes the servo motor and the range sensor. The diagrams above are not the only way you can connect the components so use at your own risk. You could test your L298N motor driver, by means of the next code. Only use the wiring diagram for the connections, and introduce in the serial monitor from you computer the numbers 1 or 2 to control the direction and letters from A to F to control de velocity. I tried “IRrecvDemo” example with pins 11 and 10, and both worked ok. It could be a wiring issue (pins should be G-V-S), or the remote control is not working properly. The LED on the module will blink when a signal is received. Any remote control should work but I found that the one that comes with kit generates a code that is easy to understand. I have updated the diagram to include the servo motor and the range sensor. 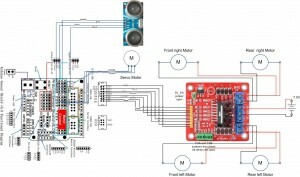 This post “Arduino robot kit – Range sensor” has some information about the distance sensor. I’ll create a new post soon about controlling the robot with Bluetooth. Can you make next post about Remote Control or Distance sensor? Thanks for the scheme, Your job is grate 🙂 i follow you and my car already can move. Thanks! Have you read the previous posts? I think they have all the details.